Brian Cranford is a junior hockey coach in Canada. He has been suspended for 1 year and fined $2,000 for letting his team skip the opening and closing ceremonies for the Nash Bridges Don Johnson Memorial Tournament in April. 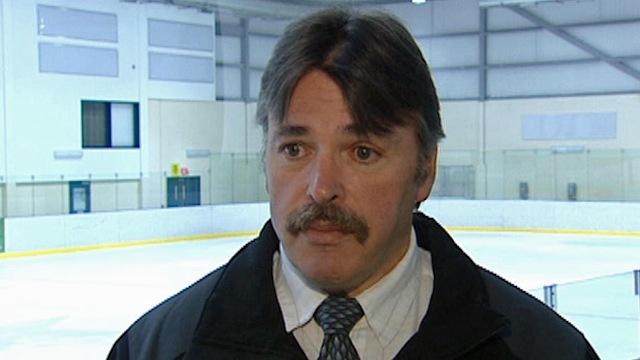 This entry was posted in Sports Steesh and tagged Canada, don johnson, hockey, hockey coach, Humor, junior hockey, memorial tournament, Moustache, mustache, nash bridges, sports on June 11, 2012 by Los Bulls. The real reason for his suspension is for not having a full goatee. Hockey coaches are the only ones who can pull them off. Amiright, Don Cherry? I’ve always thought baseball players were at the head of the class when it comes to goatees but Don has got a nice one. Touche, you have a point. I just always took my coaches more seriously when they had a goatee, haha.